The Publix sale flier goes through April 18th this week, so here are some ideas to get you through Wednesday of the upcoming week. I added an approximation of what you can expect to pay per person for these dinners. You can't eat out for these prices!! Now put all that money you are saving by eating at home in the bank! and save for something awesome!! 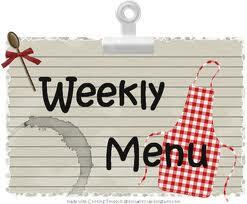 I will post a new menu and shopping list for April 19th - April 25th when the new flier comes out. Monday - Shrimp Carbonara (shrimp is on sale for $6.99/lb) This dinner is VERY easy and will cost you about $14 total -which breaks down to $3.50/person for 4! Tuesday - Chili Rubbed Pork Chop with Apricot Ginger Glaze and a garden salad - see recipe below (Boneless Pork Loin Chops are on sale for $3.99/lb) This dinner is super easy and will cost you about $9 total with the great sales this week! That breaks down to $2.25/person for 4. Tip: Spend a little extra and buy double the chops to have leftovers for lunches - the pork is so good chopped up on a salad! Wedenesday - Aaron's Missouri Burger with baked french fries (I omit the crushed red pepper from the burger recipe as it is too hot for me) Again, super easy to make and will cost you about $12 total - which breaks down to $3.00/person for 4. Prior to cooking pork, melt apricot preserves in saucepan over medium heat. Remove pan from the heat and stir in remaining glaze ingredients. Place half of the glaze in a serving bowl and hold for service. Place chili powder, garlic powder, sugar, salt and pepper in a large baggie; shake to blend. Add the pork and shake to coat. Refrigerate for 2 to 24 hours. Preheat broiler on high. Line broiler pan/baking tray with foil and spray with cooking spray lightly. Remove pork from baggie and place on foil. Brush reserved glaze on top side of pork. Place pan in oven, being sure to leave oven door ajar, and broil for 3 minutes. Turn pork over, brush top with reserved glaze and broil for 3 mins more. Remove from oven and check temp with an instant read thermometer. Temp should be 138-140 degrees. If the chops are very thick they might need more time, but just do a minute at a time and keep checking temp so you don't overcook! When up to temperature, remove from oven and let rest for 10 mins. Pork can be grilled also and the cooking times should be about the same. Serve with reserved glaze. For a lighter meal serve this with a garden salad. It is also delicious with mashed potatoes and your favorite vege.